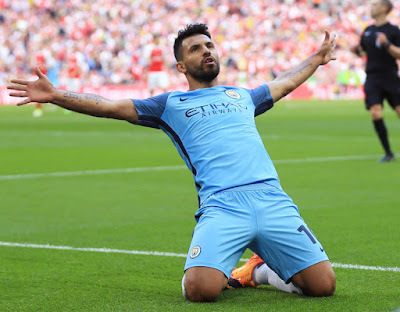 Pep Guardiola has confirmed that Sergio Aguero will miss Manchester City's Premier League meeting with Cardiff City on Wednesday. The 30-year-old limped out of his side's 2-0 win over Fulham on Saturday, with Guardiola having initially been hopeful that the injury was not serious and that he would be in contention to face Cardiff. Aguero had provided the assist for Bernardo Silva’s fifth-minute opener at Craven Cottage before scoring his 19th Premier League goal of the season before half-time. e was replaced by Gabriel Jesus after 57 minutes, however, with Guardiola revealing after the match that the switch was a precautionary measure. Aguero hasn't trained since, though, and will now miss the game against Cardiff that gives City the opportunity to move one point ahead of Liverpool in the Premier League title race. The Spaniard told reporters in his pre-match press conference: "He didn’t train the last two days, tomorrow he is not able [to play]. Maybe [he'll be ready for] Saturday, but we will see in the next days." City are chasing an unprecedented quadruple, with Guardiola's side still in with a chance of claiming league, FA Cup and Champions League glory having already won the Carabao Cup. But the former Barcelona boss is urging caution and warned his players that they risk "losing everything" if their levels drop. He added: "Everyone is excited about the next weeks, but we also know we can lose everything. It’s amazing to have this opportunity, to be there. "Beating Cardiff is our main target, then we go to Wembley and we want to try win a trophy I have never won." That Wembley date sees City face Brighton in the FA Cup semi-final before their Champions League quarter-final meeting with Premier League rivals Tottenham. The fate of the title race is also in their hands, with City knowing that they will have a game in hand over Liverpool after the Reds' game away at Southamptonon Friday evening. That match is against rivals United on April 24, with the result potentially having a huge bearing on who will be crowned champions, as Guardiola's side aim to defend their title and Liverpool look for their first championship win since 1989-90.